Today, let’s look at some other teams’ performances from the last decade. An extremely impressive decade all around (obviously). The defensive performance is perhaps a small surprise, since the offense gets so much attention. One of the most puzzling aspects of the Brady-Belichick run has been the lack of press attention on the defense. Notice the Patriot defenses of the last three years don’t come close to approaching the defensive performances of the Super Bowl winning teams from 2003 and 2004. 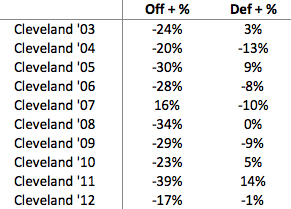 Also, notice the Patriots 2003 title came with a team that was just 5% better than average on offense. I like the Saints’ table because it clearly illustrates just how quickly teams can change their fortunes with a new coach/QB combo. Look at the offensive side of the table above; can you see when Payton/Brees joined the team? I thought so. 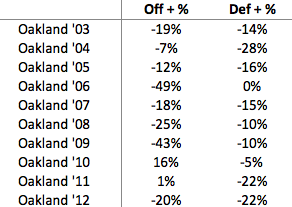 It’s also interesting to see how badly the defense has trailed the offense. 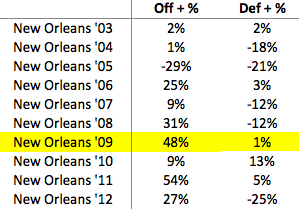 If the Saints’ defense was just consistently average, the team might have played in another SB or two. The Giants’ performance further highlights the relative randomness of the two Super Bowl titles. 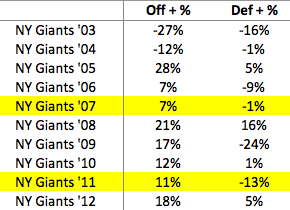 In the past ten years, the Giants have had two REALLY good teams, 2005 and 2008. Naturally, neither of those teams went to the Super Bowl. The 2007 title team remains perhaps the most puzzling SB Winning team in more than 30 years (maybe ever, but I prefer to stay within my lifetime). Not only was the 2007 team remarkably average, but they defeated the greatest team in modern NFL history. 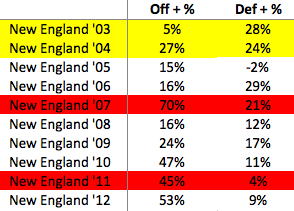 If you want a great example of the “any given Sunday” saying, compare the performance ratings of the 2007 Giants with those of the 2007 Patriots (in the table above). No comment needed other than to say the past decade in Oakland has been one of ASTONISHING futility.